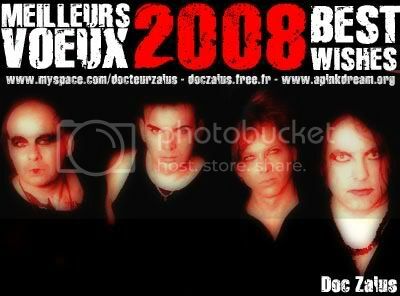 I wish you all a very nice 2007 !!!! "SpÃ©ciale dÃ©dicace" Ã Mr.Moove !!! Again, stating the obvious, but I thought if there was a heading, those who want to, can put their wishes in one place, for all to read.. I wish everyone all things good for 2008...may your year be peaceful; your hopes and dreams realised; your health robust; may you find inner strength if confronted with adversity; may you find harmony and love; for those alone, reach out, you may be surprised; be kind, just, be kind; I wish you love, life and happiness for the New Year ahead..
thanks melly.. happy new year to all! for me.... I am melting here... :( all I look forward to is cooler weather and more rain!!! Here we celebrate Szilveszter's (not the cat)name day. Not allowed to eat anything that flies or swims, as it signifies wealth flying or swimming away. & at midnight, we are supposed to eat lentils that signify coins (wealth again). Have a good evening & if you are driving in the following morning, please make sure you are fit to do so. Happy New Year everyone! Hope all of you have a wonderful New Year. And may it be filled with The Cure! Happy New Year 2008 to everyone. MY DEAR FRIENDS CUREFANS, HAPPY NEW YEAR! I WISH YOU ALL THE BEST! Happy New Year and hope that we gonna have a pleasant year..